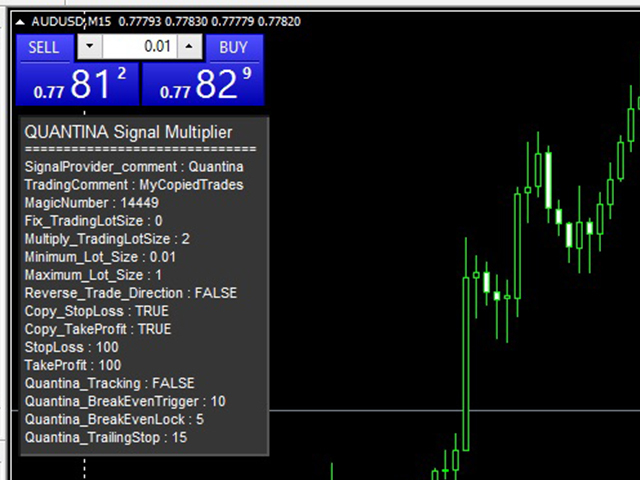 With this tool, you will able to copy any signals and multiply the trading lot size on the same running MetaTrader 4 terminal. You will also able to change comment and override SL/TP or even add Breakeven method. 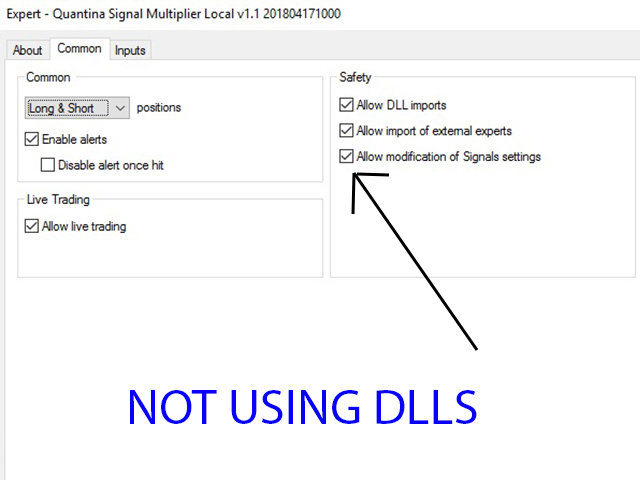 Quantina Signal Multiplier is not using any external DLL files and is compatible with MQL5 VPS. SignalProvider_Comment: EA will copy all the trades what starting with this comment. For example: If your Signal Provider using the following comment at trades: "signal_mfb1982" you have to add "signal_mfb" to copy all trades with starting "signal_mfbxxxxxxxxxx" trades. TradingComment: EA will convert the comment for the exact text + magic number to your trading comment section. MagicNumber: unique ID if you run more than one same EA on the same currency pair. Fix_TradingLotSize: you can set the EA to open exact trading lot size instead of a copied one. If this is 0.0, the EA will use multiplier. Multiply_TradingLotSize: If you want to trade 10X larger lot size than originally received signal lot size, you can set this value to 9 (1X original lot size 9X multiplied lot size 1+9 = 10). Minimum_Lot_Size: In certain case, several currency pairs or indices have the minimum required trading lot size to open any trades. If the copied lot size is less than the minimum required by broker, the EA will convert the lot size to a minimum value. Maximum_Lot_Size: Maximum allowed multiplied trading lot size. Let assumed, you have set the multiply to 10 and MaximumLot to 1.0 lot. Your signal provider opened a trade by 0.2 lot size. The EA supposed to copy this trade 0.2X10 = 2 Lot. However, the maximum trading lot size is 1.0 EA will open trades by 1.0 only. Reverse_Trade_Direction: EA will open trades in opposite direction than your signal provider. With Limit orders, it is not working. Copy_StopLoss: EA will set the StopLoss value as your Signal Provider. Also, follows the SL modifications. Copy_TakeProfit: EA will set the TakeProfit value as your Signal Provider. Also, follows the TP modifications. StopLoss: if you set not to copy the SL, the EA will use this value in pips. TakeProfit: If you set not to copy the TP, the EA will use this value in pips. Quantina_Tracking: true/false. Secure your profit. If 'false', the EA will copy every SL/TP modification as your signal provider do. 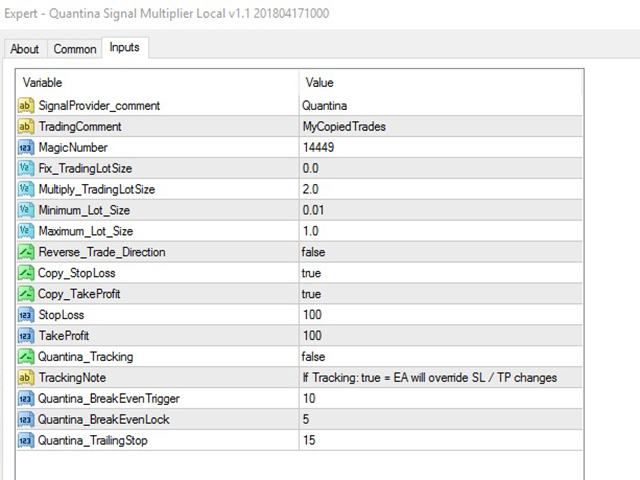 If Quantina Tracking = true, the EA will using the BreakEven method and Trailing Stop as below. Quantina_BreakEvenTrigger: In pips. The EA will move the SL to the positive area (BreakEvenLock) if the market price moved at least this pips in our favor. Quantina_BreakEvenLock: in pips. The EA will move the SL to positive area from opened price to this pips distance if triggered. Quantina_TrailingStop: Trailing Stop value in pips. It will follow the market price in positive area IF breakeven is triggered. Type the same comment at the "SignalProvider_comment" as your signal provider using. For example: If your signal provider using the "SIG-George-101" comment for each trade, you have to type the "SIG-George-101" as well. In this case, the EA will copy/multiply all the trades with SIG-GeorgeXXXXXXXXX comments. my copied order is closed automatically too? now, it work on vps and not work on pc ?i must do deactivate on pc? is it true?